A free tool from Facebook is useful for helping to characterise audiences or publics and understand demographics and behaviours. The population of the UK is 65.1 million according to the Office for National Statistics. Facebook’s usage in the UK is 39 million. The social network is reaching saturation in the UK and many other markets around the world. It has become a useful proxy for exploring demographics and human behaviour. I frequently use Facebook Power Editor, the advertising tool available to any Facebook user, as a quick test of the size of an audience or public. It takes less than 60 seconds. The tool includes usage data from Facebook, Instagram and from last week, WhatsApp. 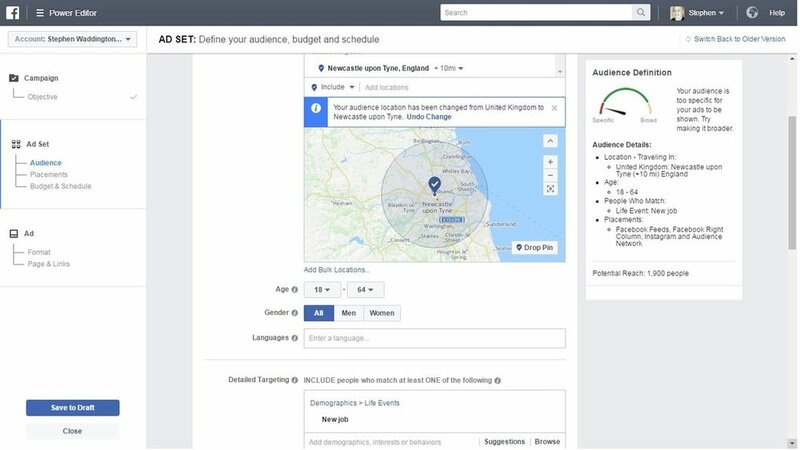 Facebook provides the Power Editor to help marketing professionals plan advertising campaigns but it can also be applied to a public relations planner. It costs nothing and is a really useful tool to use as part of your campaign workflow. Gathering insights as part of a planning exercise means that you are better informed, can develop more effective creative, and make better media choices. It’s also useful for quick fact checks. Every action we take on Facebook such as a check-in, post or reaction leaves a data trail. The same applies to Instagram, and also WhatsApp if you’ve accepted the new terms and conditions. It’s this aggregated data about behaviour, demographics and locations that we can use to inform campaigns. Facebook Power Editor enables you to access information on hundreds of data points. I’ve listed more than 50 areas below. Facebook almost certainly knows more about you than your mother. Log onto Facebook via the web and select ads from the drop down menu bar. Select Clicks to Website as the purpose of your campaign and enter a URL (it doesn’t matter what you select as you’re not creating a live campaign). Tweak each of the variables above to match the audience or public that you’re seeking to engage with as part of your campaign. You’ll notice the audience definition dashboard shifts back and forth as you make different selections. Here’s some examples for different audiences that I characterised within 30 seconds. Facebook Audience Planning is a powerful tool for quick and dirty checks on your audience or public. If you get a large number you need a broad awareness campaign. Alternatively you need to work harder to segment your audience. If you get a small number then a more selective approach would be best suited. You may even discover that the combination of a Facebook community or page and ad campaign might be the most cost effective solution to your campaign.